Waking up to the smell of a freshly baked croissant wafting through your apartment is a nice way to start the day. It isn't one most of us get to experience very often, though. But in this age of never-ending gadget invention, you can ease into the day with the scent of warm pastries every morning. Sadly, the pastries are not included. 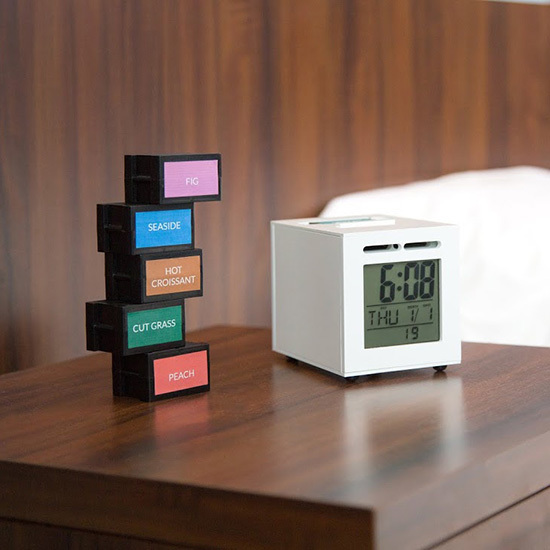 The SensorWake is a sleek, modern alarm clock that, instead of using a brain-rattling buzz or the generic ringtone on your iPad at 6:30 every morning, wakes you up with one of 12 scents like coffee, croissants or, for the budding titans of finance, dollar bills. Tests seem to indicate that jostling people awake through their noses really does work. The clock’s 18-year old inventor, Guillaume Rolland, studied 100 people, and all of them woke up within two minutes. Rolland funded the SensorWake in a matter of days via Kickstarter, pulling in more than $112,000 at the time of writing. Early adopters can pick up a clock and scent of their choice—which supposedly lasts for 60 wake-ups—for $88 here and start experiencing what sounds like a much more pleasant wake-up in November.